On Facebook one of the many pages I've liked is Live Nation which is a company that handles live events. (http://facebook.com/livenation) In May 2013, Live Nation's Facebook page announced they were holding a contest for the Package tour. The billing for the tour is Boyz II Men, 98 Degrees, and New Kids on the Block. I love music from all 3 groups so I entered. The contest let me pick a date. There were 2 dates that were close to me in San Jose, CA. One of the dates was the 7/7/13 Sunday show and the other was the 7/12/13. I chose the Friday 7/12/13 date so that if I won I could recover from the concert on Saturday which is my day off. Fast forward to July 7th, I was at work bored out of my mind. I checked my personal e-mail and noticed an e-mail with the subject "FW: Congratulations! You are a potential winner of the NKOTB Sweepstakes!" I enter tons of contests so to get a winning e-mail on a Sunday is rare. I opened up the e-mail and was in shock when I read what I won. 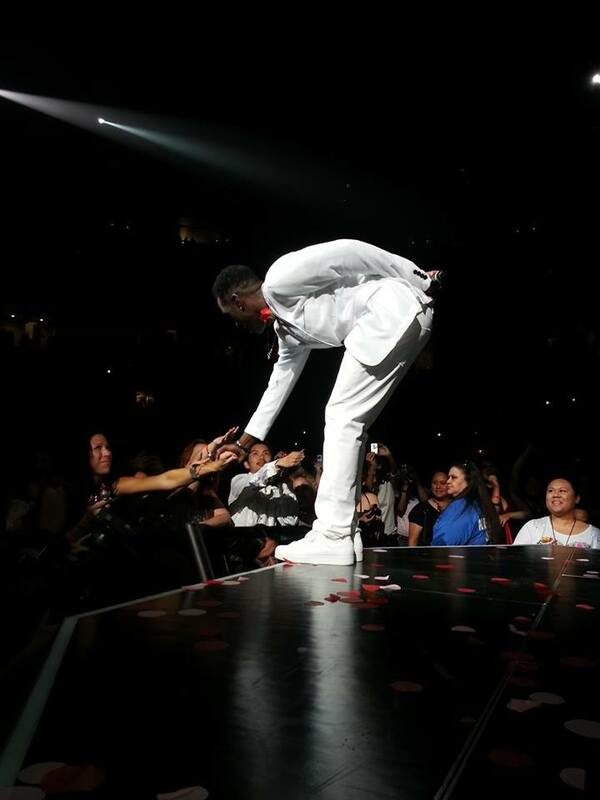 Two (2) VIP Packages to The Package Tour at the HP Pavilion in San Jose, CA on July 12th, 2013. 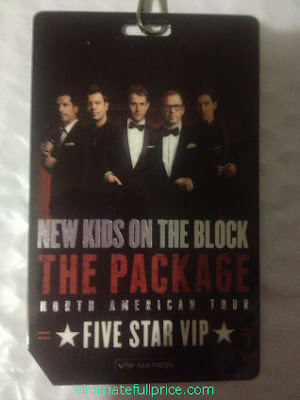 -one (1) New Kids On The Block Total Package commemorative laminate; access to crowd free merchandise shopping experience, and access to onsite VIP host. Approximate Retail Value of each Grand Prize is: Two Thousand Dollars and No Cents ($2000.00). What I put in bold is what I actually received. I've e-mailed and tweeted Live Nation and VIP Nation to see what they can do about the other things I was promised I would get. Hopefully they can work something out. The reason I didn't bold the "Total Package" part in the last item is because the laminate I received said I was a 5* VIP. I had to read what I won more than once. 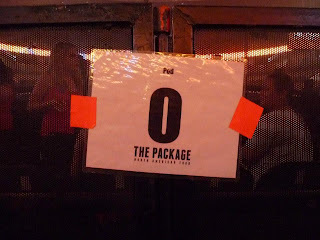 At first I didn't plan on going to the Package tour. I was saving all my money for Backstreet Boys' tour and cruise. As cheesy as it is, tears welled up in my eyes when it finally hit me I won. 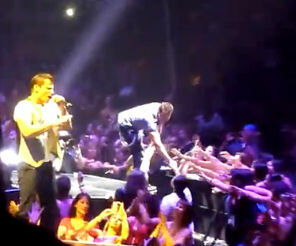 Not only was I going to the concert I was going to meet New Kids on the Block! I've never met any of them before! Back when the tour was announced, I entertained the thought of buying their VIP but it was too expensive so I passed. Once I found out I won, I decided to buy tickets off Stubhub for the 7/7/13 show so that I can get an idea what would happen for the 7/12/13 show. I took my mom to the 7/7/13 show because she loves Boyz II Men. I managed to get two lower level section 110 for $51.95 off Stubhub. That was a great deal since those tickets would have cost $176 if I paid full price. As my guest for the 7/12/13 show I decided to take my friend Laurel. 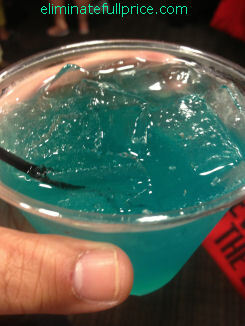 She was my companion during my infamous Backstreet Boys in Napa win. I know she loves New Kids on the Block so I thought she was the right choice to enjoy my special win. Laurel, my mom, and my tax lady were the only people I told that I won the contest that day. I didn't want to broadcast it all over Twitter and Facebook until I was 100% sure the prize was mine. A lesson I've read from fellow people that win contests is to not announce anything until everything is fully confirmed because at anytime the promoter can change their minds and take the prize away. Since the prize was valued at $2,000 I had to get forms saying I accept the prize notarized and e-mail the forms before 1 PM on 7/8/13. Finding a notary on a Sunday wasn't easy. At first I went to the printing place near my house where I normally get my papers notarized. Unfortunately the notary was off so I went to the next notary place I usually went to which was the UPS store. To my surprise that UPS store no longer existed! I then went to the next UPS store I knew of and discovered it was closed on Sundays. I sat in the parking lot so disappointed. I was on my phone trying to find a notary but no luck. The notary's I pulled up either were closed and/or had terrible reviews. I was about to give up when I remembered my mom had said before that our tax lady is also a notary. I took a gamble and called her. The tax lady was nice enough to invite me to her house on a Sunday to get papers notarized! Once I got the paper notarized I went home and tried to scan it and turn it into a .pdf file. That was kind of a pain because my computer is old and slow. Eventually I had to put a pause on my form sending since I had the concert to go to. The 7/7/13 concert was so fun. I was surprised by 98 Degrees' energy, especially Justin Jeffre's. I know he's not the most popular one but to me he has stage presence and he didn't come off as a back-up singer. I was kind of surprised though that most of the section I was in was sitting through most of the concert. I'm not used to sitting at concerts. I stood up for some parts. 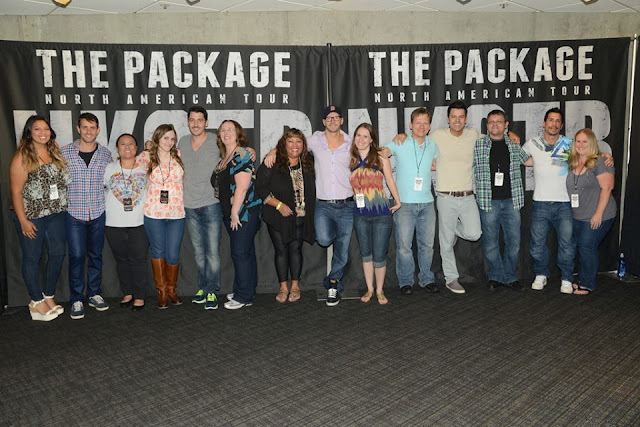 Seeing the 1st night of the Package tour made me even more excited for the 2nd night when I knew I'd have closer seats and a meet & greet with New Kids on the Block! Through Live Nation's Facebook I was able to see pictures of winners from each show. I saw that one of my Facebook friends Brandy Williams won for the 6/14/13 show. I asked her a ton of questions about the prize. She told me for her prize, she got 2nd row seats inside the security barricade, a 5* VIP, gift bag, and 2 shirts. Finally on 7/8/13 I got confirmation from Live Nation that I was a winner so I tweeted and shared the status on Facebook. It was hard to concentrate on work when all I wanted was it to be 7/12/13. The week dragged but finally the day came! I got to the venue 10 minutes later than I expected because I was so anxious to exit off the freeway that I took the exit before the actual exit lol Thankfully I found the venue since it I could see it from a distance and there were signs pointing to it. I sadly give $20 away to park at the venue and then go to the meeting place for the VIP. Laurel is already in line so I join her. Since the 5* VIP has M&G's done in groups of 10 beforehand on Twitter and Facebook, Laurel and I tried to find other group members. I had found a fan named Caroline who was a Jon girl. She was with her friend Gen who was a Jordan girl and she found a fan from Germany named Skye who's a Donnie girl but was willing to stand next to Joey for the picture. We tried our best to wait for the other girls in our group and let the line go by for check-in. When there were no more fans to check-in VIP Nation told us to check-in or risk not going into the M&G at all. Reluctantly we all check-in and then discover that Laurel and I got a "T" letter when Caroline and her friends got an "R" letter. The way VIP Nation is set up are 5 * VIPs are assigned group letters. Since we had "T" and Caroline and her friends had "R" we couldn't be together in a picture. At first we were all disappointed to be split up, however in the end it worked out for everyone. The "T" group ended up being people who won through contests too! A mom and daughter won through 96.5 KOIT. 3 friends won through what I think is 97.3's Facebook page. 2 guys won from NBC Bay Area. I was nervous about who to stand next to at the M&G since we had a completely new group however the people in the "T" group were SUPER NICE! Part of being a 5* VIP included access to the pre-show room with refreshments and 2 free drinks. The refreshments included tiny sandwiches, veggies platter, chips, and popcorn. I didn't want to eat too much in fear of having something stuck in my teeth so I stuck with the tiny sandwiches. 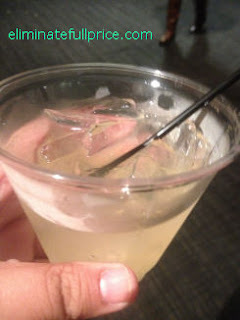 For my 1st drink I had a margarita. While we sat and mingled with our group T members, Donnie Wahlberg came from behind the black curtain and waved at everyone for about 30 seconds before he hopped back behind the curtain. I hugged Danny first. Then next was Jordan. I've loved Jordan ever since his solo single "Give It To You." He was my crush right before Nick Carter took over the reign and hasn't left since. I was so amused when Jordan waved at me and we hugged. I sort of didn't want to let go. Next to Jordan was Donnie and he was occupied by the other group members so I didn't want to barge in so I moved on to Jon and then next to Jon was Joey. Joey's blue eyes are so beautiful in person. Someone in the room said it was time to take the picture. One of our group members was still off to the side, and Joey was like, "Hey! Wait" and pointed to the girl who ended up standing next to my left. I thought that was so sweet he was worried about her not being in the picture. We take two pictures and then it's all over. I wish I had something clever to say to Joey but all I could think of was "Have a good show!" and I patted his back lol He said, "Thank you." It went by so fast and I was kind of bummed I didn't get to hug Donnie but I was happy I got stand next to Joey. After it was over we continue to hang out in the pre-show room. We get our gift bags. I love tote bags so I was soooo happy to get one. 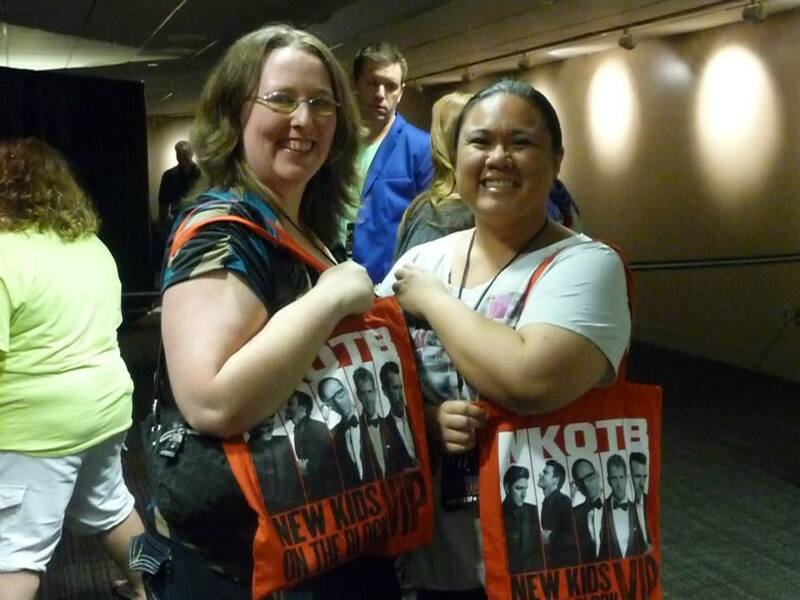 I remember on Sunday I saw a fan with the tote bag but I didn't know it was exclusive to VIP holders only. Inside the tote bag was a pair of knee high socks which is just sooo perfect for summer... not :p and a speaker to attach to either a cell phone or mp3 player. Someone then makes an announcement saying if anyone is interested in crowd free shopping they can leave the room to shop. Mostly everyone took the opportunity to leave. I wasn't really interested in buying anything since I got a tote bag already and I was expecting to get a $100 voucher from my prize (which I didn't receive). One of the other winners, Larry, was also expecting a $100 voucher and we had tried to see if we could find out how to get it. The SAP Center staff was helpful in trying to find an answer, however, they said they weren't in charge of merchandise and that Live Nation/VIP Nation was. Unfortunately we were unable to make contact with anyone from Live Nation/VIP nation. Laurel and I then head down to the floor to find our seats. Our tickets were section O row 2! When we got to our seats I couldn't believe how close we were! The stage is set up in the round and there's five sections around the stage called pods. Each pod has a letter: N, K, O, T, & B. The O pod was on the tip of the main stage. Within our pod there were only 9 people! Our chairs said "Total Package." It was like our prize was 5 star VIP with a Total Package ticket. For those who don't know the way New Kids on the Block do their VIP's is as follows: Total Package is the most expensive followed by Five Star Front Row, Five Star Plus, Five Star, and Four Star. On Sunday night I saw during "My Everything" they chose 4 fans to serenade on stage. 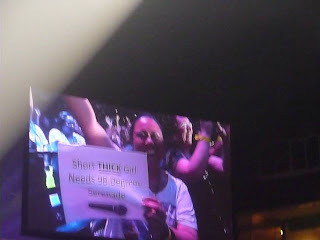 It was a stretch but I decided to make a sign that said, "Short Thick Girl Needs 98 Degrees Serenade." For those who don't get the reference on 98 Degrees' latest album there's a song called "Girls Night Out." In the song Justin Jeffre sings, "Short, tall, thick, small, all of them winnin." I didn't get chosen by 98 Degrees for the serenade buuuuuut the camera man during the show loved my sign so he asked me to hold up my sign to broadcast over the screens in the arena lol I had no idea Laurel was able to get a shot of me holding my sign on the screen. Drew Lachey and Jeff Timmons were the only 2 members of 98 Degrees that reached out to me and Laurel when they came onto the little stage that extended from the stage. I read from other reviews that those little stages are called petals. Laurel and I got our hands touched by Drew during "Invisible Man." 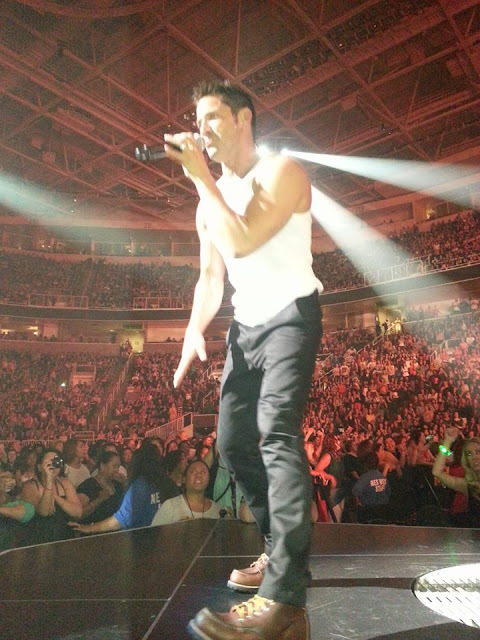 I got my hand touched by Jeff Timmons during "Give Me Just One Night (Una Noche)." After 98 Degrees was New Kids On The Block. They first started off at the rectangular stage at the end of one part of the arena. Then they made their way toward the round main stage that was close to the center of the arena. What I loved about being in a pod is there were only 9 fans there. I didn't have to worry about being pushed or having a fan pressing up against me just for a chance to touch a NK. I really loved during the middle of the show when they sang some acoustic versions of their songs and covers of famous songs like "Kiss" by Prince, "Faith" by George Michael, and "I'll Be There" by Jackson 5. The following video shows Jordan right before he does it. Too bad the camera person couldn't have kept on recording for 5 more seconds lol http://www.youtube.com/watch?v=Fe8xrDKcvV4. Also what I love about NK's Cali shows is they play "California Love." I love hearing that song and dancing to it along with NK. We were so close I could see the sweat dripping on their skin. I could see the ridges and cuts of Donnie Wahlberg's muscles. I could feel the stage shaking as they danced inches from me. It was an experience I'll never forget. I'm forever grateful to Live Nation for giving this opportunity to meet NKOTB and see them up close. 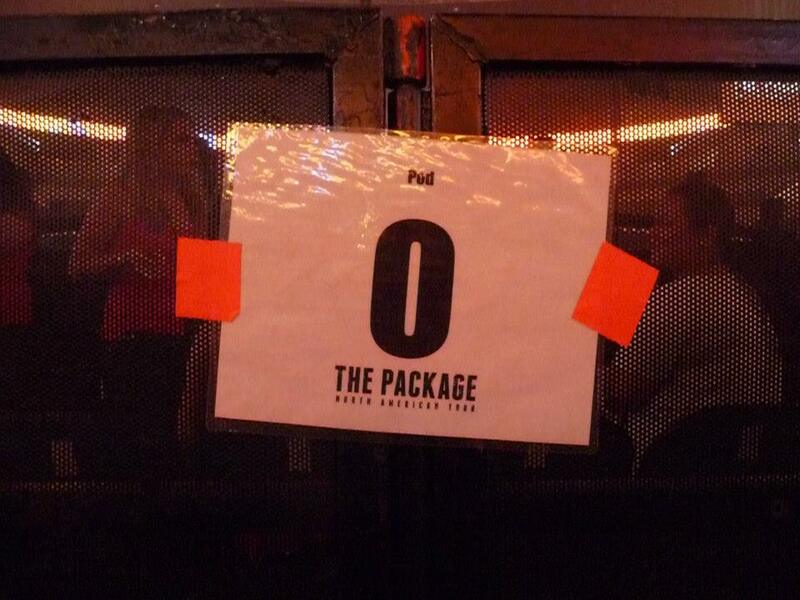 The Package tour is a package I wish would be delivered to me every night. If you haven't seen the show and they're coming to a city near you, I highly recommend it. OMG in that pic of Una Noche.. it looks like I'm going to start gnawing on Jeff's arm!!! LMAOOOOOOOO Oh man... so many memories!!!!! THANK YOU JOCELYN!!!! I swear, you have the boyband mojo people dream of!